Your Financial Road Map is a personalized, confidential report covering every important facet of your financial life. It is based on a straightforward questionnaire that takes only about 30 minutes to complete. Your report is filled with analyses and guidance pertaining to your own financial situation. Any good road map tells you where you are and how best to get where you're going. Your Financial Road Map is a remarkable and remarkably affordable report that does the same for your financial journey, helping you move toward your goals armed with knowledge, clear direction, and confidence. Important note: Your Financial Road Map is not available to the general public. You may take advantage of it if you are affiliated with a company or association that is offering this valuable service to its members, employees, or selected customer groups. Your Financial Road Map does not endorse, sell, nor is affiliated with any insurance or investment company. All information in the questionnaire and report will be kept in strict confidence, and names will not be given to any other company or organization. The price for this valuable, personalized service is only $150. 1. Are your investments properly diversified? The problem: Millions of investors have seen their financial security wiped out over the last two years because they put too many of their nest eggs into a single basket. The solution: Your Financial Road Map will show you how to better diversify your investments to avoid the big losses that have plagued so many investors. 2. Do you understand how current economic conditions affect you and your money, and are you making the wisest financial choices right now? The problem: Americans are overwhelmed with financial information that's usually confusing and often biased. The Solution: Your Financial Road Map offers timely guidance in your personalized report and provides updates and weekly "Smart Money Tips" through its exclusive web site to help you make smart money decisions throughout the year. 3. Do you have adequate insurance coverage? The problem: Over 80% of Americans lack comprehensive insurance coverage. For them, a single loss, illness, or disablility can wipe out a lifetime's worth of hard-earned savings. The solution: Your Financial Road Map will show you how to correct any deficiencies in your insurance coverage, customized to your own insurance needs. 4. Are you in debt? The problem: Over the past four years alone, 5% of American families have declared bankruptcy, and the numbers are expected to rise as tens of millions are choking on debt right now because they borrowed too much for the wrong reasons. The solution: Your Financial Road Map will help you manage your credit before it manages you and will provide a "how to" for eliminating wasteful debt. 5. Are you overpaying your income taxes? The solution: Your Financial Road Map will show you which of the great new tax breaks make the most sense for you, based on your own tax situation. 6. Have you planned your estate correctly? The problem: Six out of seven adults don't even have a will, which means the state courts will decide who gets their money and who takes over for them if they become ill. The solution: Your Financial Road Map will present individualized step-by-step estate planning guidance to help protect you and your loved ones both now and later. 7. Are you taking advantage of the new ways to save for your children's or grandchildren's education? The problem: Most parents and grandparents save for college in high-taxed accounts that produce 30% less income available to meet college expenses compared with the new college savings plans. The solution: Your Financial Road Map will show you which of the new tax-advantaged education savings plans provides the maximum benefit based on the youngsters' ages and your financial profile - and it's not too late to switch into the best plan for you and your family. 8. Are you prepared to meet any unexpected financial emergencies? The problem: Everyone experiences periodic financial emergencies, but most lack the knowledge and wherewithal to weather the storm which just makes a bad situation worse. The solution: Your Financial Road Map will help you take action to stave off financial emergencies and will identify sources of money that can be accessed quickly. 9. Do you have a plan for achieving a financially comfortable retirement or, if you're retired, a plan for thriving throughout your retirement years? The problem: The statistics are startling. Almost two-thirds of adult Americans are not on-target to having enough money to retire and millions of retirees are running out of money late in life. The solution: Your Financial Road Map will provide you with tools to evaluate your progress in attaining and maintaining financial freedom, personalized to your specific age and retirement aspirations. 10. Are you confident you haven't overlooked a money matter that's crucial to your financial well being? The problem: You probably know what you should be doing to promote your financial health, but it's easy to feel overwhelmed by it all. The solution: Your Financial Road Map will provide a "to do" and a "how to" list in order of priority to help you on the road to achieving lifetime financial security. If you answered "NO" to one or more of these questions, Your Financial Road Map will help you improve your financial health. To assure future well being for you and your loved ones, your financial health is as important as your physical health. Each Your Financial Road Map report is custom produced based on your responses to a confidential questionnaire. Your report will be unlike any others since your financial situation is unique. Your report provides objective information and guidance, unlike costly reports prepared by large financial institutions that promote their own products and services. Your questionnaire and report will be kept strictly confidential and your name will not be given to any other organization. If you want complete confidentiality, the email questionnaire and report option can be completed without indicating your name and address on your questionnaire. All that's required is your password which is included with your questionnaire and an email address where you would like us to send your report. Your report is based on an in-depth analysis of your responses to the questionnaire. It deals with your own unique needs and covers every important investing and financial planning area that is relevent to you. No two reports are alike. With your concise, no-jargon report in hand, you'll be armed with a powerful and sensible second opinion on matters that are specifically relevant to your unique situation. Your Financial Road Map will identify strengths, reveal potential problem areas, and outline specific, step-by-step future strategies from investing, savings and insurance, to tax matters and retirement planning. What is Your Financial Road Map? While it begins with a personal questionnaire, Your Financial Road Map doesn't end when you receive your personalized report. Rather, your report is a process that allows you, perhaps as never before, to move knowledgeably and confidently from the present to the future. How Do I Receive My Questionnaire and Report? 1. Via mail. You are most welcome to use the traditional method of receiving your Road Map report by completing and returning the questionnaire by mail. You will receive your report either by return mail in about three weeks or by email in one week. It's your choice. 2. Via email. Your questionnaire can also be completed on the Web and then submitted to us on a secure site. You will receive your personalized report via email within one week. Email instructions and a required password will be included with the questionnaire that's sent to you after you place your order. Who Should Use Your Financial Road Map? Financial wellness is a goal for virtually everyone. Over the last decade Your Financial Road Map has been used successfully by individuals and couples just starting out, mid-career families, wealthy individuals, pre-retirees and retirees. If you don't currently have a financial plan, Your Financial Road Map will help you develop one; and if you do have a plan, Your Financial Road Map gives you the power of a second opinion in weighing your plan's strengths and weaknesses. How is Your Financial Road Map different from other financial plans? Your Financial Road Map is completely unbiased, objective and obligation free. It is not intended to sell you any particular product or service; no solicitation of any kind will follow. While your report will provide specific strategies and recommendations, the report is yours alone and you are free to use its information as you desire. The information in your questionnaire and report will be completely confidential, and your name will not be given to any other company or organization. How difficult is the questionnaire? The power of Your Financial Road Map lies in its high degree of relevance to your own situation. Thus, the questionnaire is very comprehensive in nature. But the questions are straightforward with most people able to complete it in under an hour. Who will have access to the information in my questionnaire and personal report? All information received from and sent to you will be kept strictly confidential. Your name will not be given to any other company or organization. If you complete the questionnaire and receive your report on the Internet, you don't even need to reveal your name or home address. 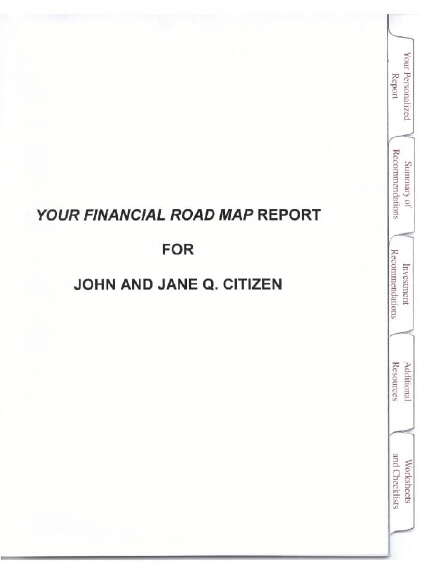 How long will it take to receive my personal Your Financial Road Map report? You will receive Your Financial Road Map personal report by mail within three weeks after submitting your personal questionnaire by mail. If you choose to receive your report by email, you will receive it within one week. What kind of guidance will I receive in my personal report? A clear view of what steps should be taken to improve your financial future. What's contained in my report? 2. Investment Guidance. Because investing is so crucial to your financial future, a separate section of your report is devoted entirely to your investment situation. This section includes a Diversified Investment Strategy that shows you how to diversify your investments, depending on your specific financial status. 3. Summary of Recommendations. While each report is different, the typical Your Financial Road Map report contains 40 to 60 different recommendations to help you achieve a better financial future. It's easy to feel overwhelmed by the sheer number of recommendations, so the priority listing of your report lists and explains each recommendation in order of priority so you can take immediate action on your most important financial matters. 4. Worksheets, Checklists, and Publications. The final section of your report contains useful worksheets and checklists to help you organize your finances and refine the guidance contained in your report. This section also contains references to helpful free or low-cost publications and web sites. Like everything else in your personal report, the information contained in this section is customized to your own financial situation and needs. What do I do after receiving and reviewing my Your Financial Road Map report? The future is yours and your report will contain recommendations on actions you should take either on your own or when seeking additional guidance from attorneys, insurance agents, investment advisors, tax consultants, financial planners, banks and credit unions. 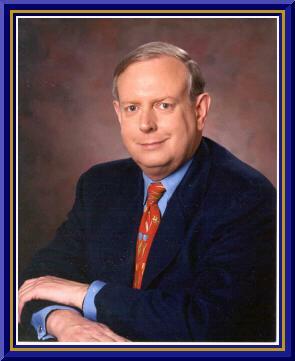 Through his books, PBS television programs, network TV appearances, and radio programs, Jonathan Pond has brought concise, understandable, unbiased financial guidance to millions. Your Financial Road Map is the result of over a decade of Jonathan's work to bring his award-winning brand of personalized financial insights and direction to individuals and families, young and old, wealthy and those just starting out. Tens of thousands of people have already benefited from his personalized reports. 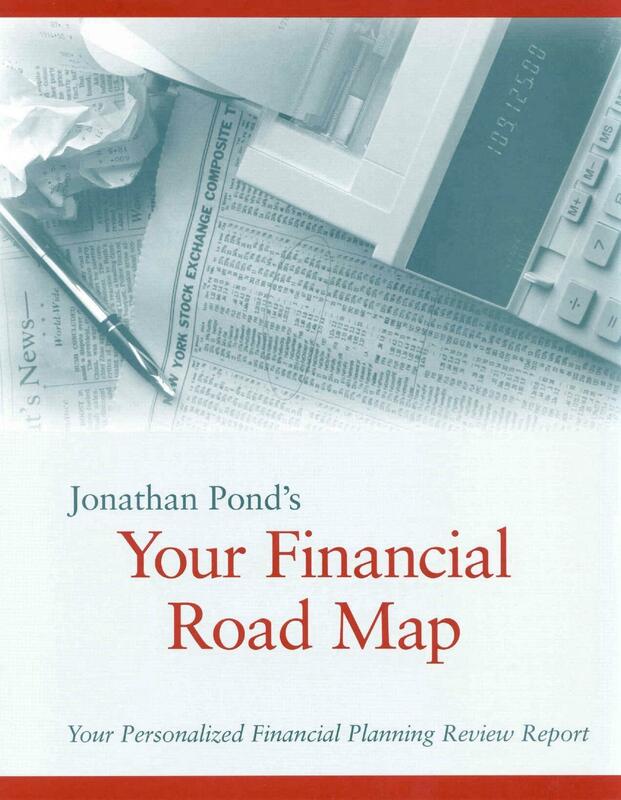 Through Your Financial Road Map, Jonathan's powerhouse thinking provides a highly personalized review of your finances tailored specifically to your own circumstances and resources. the University of North Carolina, Emory University and Harvard Business School. most sought-after speakers on investing and personal financial planning. 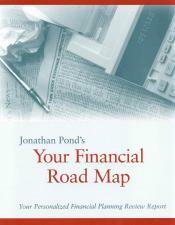 After hearing other people rave about their Jonathan Pond personalized financial reports, I ordered one. I was (and still am) amazed at how accurate, unbiased, and informative it was! I have used many financial tools in the past that claim to give personalized information, but nothing compares with the guidance in my report. Its like my own money reference guide. I cannot thank you enough for your report, which I continue to reread. I am taking your advice in small steps, but with the whole picture in mind. Please accept my thanks for a job well done. I've paid a lot of attention to my investments and other financial matters over the years. I also have used financial people to advise me, so I didn't think your report was going to tell me things that I didn't already know. But it did. In fact, the report contained several great tips and recommendations that neither my advisers, nor I had ever thought about. I didn't think your report could do it, but you've helped me make some big improvements in my personal finances. I want to let you know how important our financial report has been to our family. Like many parents, we felt like we weren't making a lot of progress with our money. But your report showed us ways to improve our current financial situation and to have a better financial future. I'm happy to report that in the six months since you sent us our report, we've done all of the high priority items you recommended, including getting wills, adding to our retirement plans, and acquiring more insurance. We've also been able to save money by making some financial decisions on our own. My husband and I now know we can reach our financial goals thanks to you. Your financial planning report has meant a great deal to me. I'm one of those baby boomers you read about 15 years until retirement with not a lot to show for it. Frankly, I pretty much thought my situation was hopeless. But you have given me hope and a lot more sleep! True to its name, my report is a well-organized road map to a better financial life which I refer to constantly. I know I've got my work cut out for me, but for the first time I feel good about my financial future. You're offering a wonderful service, and I sincerely appreciate it. Thank you for my report. I'm probably like most people in that I approach my finances on a piecemeal basis - never considering how all of the various facets of my financial life fit together. But the completeness of my report will allow me for the first time to approach my finances with confidence in knowing what I need to do in every area of my finances. We can't thank you enough for our Financial Road Map. It is truly a gift if there ever was one! I was almost in tears (of joy) when I looked it over. I've been busy with taxes so I haven't had a chance to be too thorough, but I plan to soon. Thank you, thank you. I was astonished at how many places you recommended we go for free information. Again, there is no way we can describe the benefit your report was to us. Many thanks. Your Financial Road Map has taken on a life of its own in my life. I have spent the past decade developing and refining it with one objective in mind: to give you financial guidance that will help you and your loved ones enjoy a better financial future - guidance you can trust. But letters like the ones that appear above sustain me during the long hours I spend working on Your Financial Road Map . It gives me immense pleasure to be able to make a positive difference in peoples financial lives, and I sincerely appreciate the trust they have placed in me. C. Printing out a blank form, completing it by hand, and mailing or faxing it. You will receive your questionnaire either by email or by return mail, the choice is yours. Fill out the questionnaire and return it to Jonathan Pond's office for processing by mail or by email. Within three weeks you will receive your own Your Financial Road Map personal report in the mail or, if you request to receive your report by email, you will receive it in one week. Heres some information that will help you better understand how Your Financial Road Map works. Shortly after you send in your order form , you will receive your questionnaire by return mail. The questionnaire is very easy to complete. You can fill in your answers on the questionnaire itself and mail it back for analysis and report preparation or you can use the password that accompanies the questionnaire to fill it out on the Internet and email it to us. Most people can answer all of the 80 questions without having to refer to any of their financial records. It takes about 30 minutes to complete; even those who have to dig up some financial data report that they finish the questionnaire in less than an hour. While most people fill out their questionnaire shortly after they receive it, you have up to one year to return it. Once youve completed the questionnaire, send it to Jonathans office either by mail or email. Within three weeks, you will receive your personalized financial review report by return mail or within just one week if you request your report by email. Depending on your own financial circumstances, your report will range in length from 30 to 45 pages. See below for a description of whats contained in your report. Within three weeks (usually less) of sending in your completed questionnaire, youll receive your bound report by return mail or, you can choose to receive your report by email in just one week. The report is filled with information pertaining to your own financial situation. It provides guidance and recommendations that are based on your responses to the questionnaire, and takes into consideration your age, family status, income, and special needs that are indicated in your questionnaire. While no two Your Financial Road Map reports are alike (in fact, no two reports are anywhere near alike because everyones financial situation is unique), each report contains five sections. - Planning your estate to minimize expenses and ease the burden on your family. The main report is well organized and is written in easy-to-understand language that reviews your financial situation in a positive, encouraging manner. Youll no longer have to approach your financial future with trepidation. The guidance contained in your report is both helpful and hopeful. 2. Priority list of recommendations. Everyone has a lot of room for improvement in their financial lives, even those who devote a lot of time to their personal finances. Since Your Financial Road Map takes an in-depth look at every important area of your financial life, your report will make anywhere from 40 to 60 or more recommendations. Its easy to feel overwhelmed by so many recommendations, so each report contains a priority listing that lists the recommendations in order of priority so youll be able to attend to the most important ones first. And, like the main report and the investment recommendations (described below), your priority listing applies to your own financial status and needs. No two are alike. 3. Investment recommendations. The third part of your personalized report is a diversified investment strategy based on your own financial status, including the amount of money you have available to invest, whether your investments are in retirement accounts, taxable accounts, or both, and how comfortable you are with investment risk. Based on the information provided in your questionnaire, Your Financial Road Map will suggest a way to diversify your investments as well as provide recommendations for investing wisely and well. 4. Additional resources. This section presents a list of helpful free or low-cost publications and free web sites that Jonathan feels will be helpful as you plan your financial future. Your list of additional resources contains only resources that apply to your financial situation. Like the other sections in each Your Financial Road Map report, the resources list is tailored to your own unique needs. 5. Worksheets and checklists. Several helpful worksheets and checklist are also included in your report. They are not bound into your report; rather, they are put in a pocket for easy access. These easy-to-use tools will help you organize your records, measure your financial progress, determine how much life insurance you need, plan your retirement, and more. One of the most-appreciated features of Your Financial Road Map is that it doesnt waste your time dealing with matters that dont apply to you. For example, if youve got kids to educate, your report will give you some suggestions to help you surmount that financial hurdle. But if you dont have kids or youre an empty nester, your report wont cover that subject. If youre retired, your report will be vastly different from a report for working age people because your financial needs and concerns are different. In addition to the helpful guidance provided in their reports, one of the features that people who take advantage of Your Financial Road Map most appreciate is Jonathans objectivity. Hes in the business of providing unbiased information to people of all financial circumstances. While his recommendations may not please some of the big financial institutions, you can rest assured that he always has your best interests in mind. As opposed to virtually every other available personalized financial report (most of which cost 10 or 20 times more than Your Financial Road Map, hes not trying to steer you into certain financial products nor is he trying to sell you expensive financial services. Whether you use a financial adviser or handle your finances on your own, he believes you can take better control of your financial future, and this is exactly what your personalized report will help you do. work-related income, or I am retired. insurance, or I am retired. a loan or credit card recently? purchase within the next few years? second mortgage on your home? 28. How did you purchase your last car? o Not applicable. I don't own a car. employment income do you save? 33. Who selects your investments? The following "Personal Record Keeping Organizer" serves two purposes. first, you can indicate next to each item where that particular item is now located. Second, you can organize your personal records by consolidating your documents into the three "Files" noted below.